The community of Duck can be found just north of Kitty Hawk along Hwy 12. 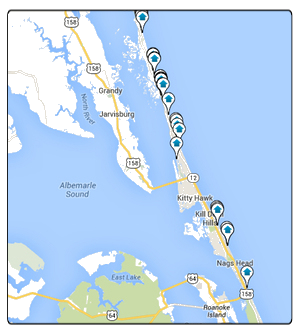 Miles of trails, both walking a biking, give duck that “small town” feel and make it one of the more desirable areas on the Outer Banks. The homes for sale in Duck currently range in price from under $100k all the way to $4.5 million. If you find a homes for sale in Duck you would like to view, please give us a call!